This 9mm Luger ammunition from Winchester is loaded to NATO specifications, making it a bit hotter than typical for this cartridge. 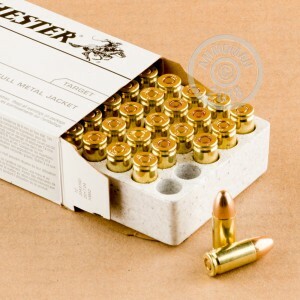 Each cartridge in this box of 50 fires a medium weight 124 grain full metal jacket bullet at a muzzle velocity of 1,140 feet per second. While this ammo is not designated +P, it should be treated similarly to one when it comes to firearms not rated for +P rounds. On the plus side, it makes a more realistic training load for those who carry high pressure cartridges for self defense due to its higher recoil. Winchester ammunition is loaded in Oxford, Mississippi using non-corrosive Boxer primers and reloadable brass cases. My Llami Omni 9MM Parabellum seems to have frequent jams and mis-feeds with 9MM Lugar cartridges. 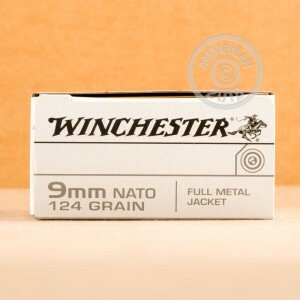 The heavier bullet and larger powder charge of the Nato cartridges has solved the problem! The pistol feeds just right now and can run through 14 rounds (original 13 round magazine) in a very rapid, reliable fashion. A+ and thanks!